Also wanted to let you know I am working on getting the Bussey Family Cemetery online. This cemetery is located in Talbot County, Georgia. 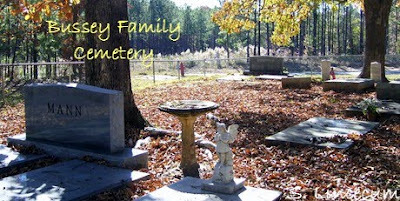 Here's a direct link to the work in progress -- Bussey Family Cemetery. A transcription is also available in the USGenWeb Archives. It was recorded in 1972. My transcriptions were completed last year, so some new burials are included.